Hoary Rock-rose is not easily confused with other wild plants on this web site. Under the 1999 Flora (Protection) Order, this plant is protected in the Republic of Ireland which means that the picking, uprooting, sale or possession is prohibited, except under licence. 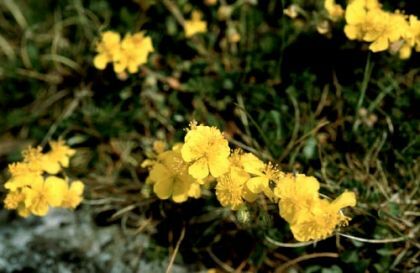 Helianthemum means sunflower and this small, creeping undershrub carries its racemes of small (10-15mm) golden-yellow crinkly-petalled flowers like small bursts of sunshine from April to July. At the centre of each flower is a crowded cluster of golden stamens. The dark green, opposite leaves are silvery beneath. 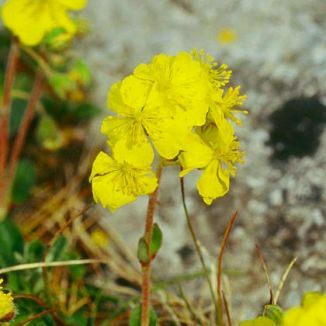 A native plant, only occurring in Co Clare, this plant is found growing on limestone rocks. It belongs to the family Cistaceae. I first identified this beautiful little plant in The Burren in June, 2004 and photographed it in the same spot on that date.